Today I have removed the Tag Cloud from this blog. I never really found it that useful, preferring instead to use the Search tool to find content or to refer to older posts. It was also sometimes awkward to know what tag to put on a post, and I also found that "YouTube" and "Education" were dominating the tags. 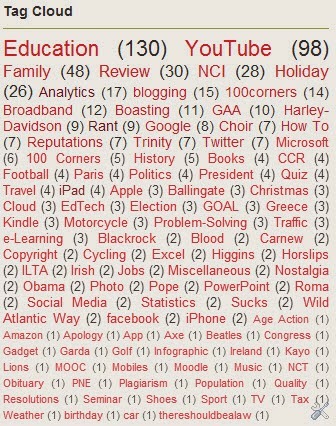 So the tag cloud is no more - and I have to confess that I rarely used it. I see them featured on other blogs and they may be useful where there is less variety of topics than I have. You can see from the image to the left of my last tag cloud that my tags ranged from "Shoes", to the "Pope", and to "Choir". Another reason for getting rid of the tag cloud is to free up some space on my home page. 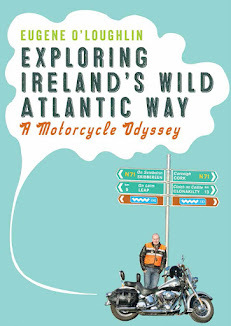 Hopefully this will soon be occupied with an ad display for my new book "Exploring Ireland's Wild Atlantic Way".